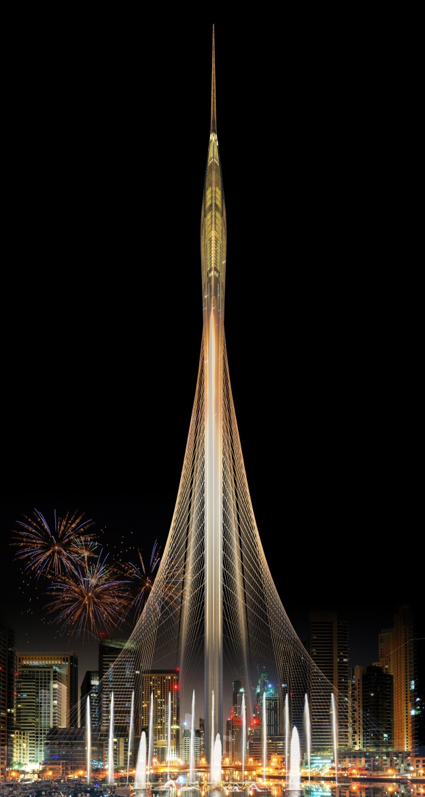 Santiago Calatrava took the top spot in an international design competition for an observation tower in the Ras Al Khor district of Dubai, commonly known as Creek Harbour. Awarding the prize was Vice President and Prime Minister of the UAE and ruler of Dubai, His Highness Sheikh Mohammed Bin Rashid Al Maktoum. The project has been hailed as an “architectural wonder” by His Highness Sheikh Mohammed, who also compared it to the Burj Khalifa and the Eiffel Tower. Beating five other firms in the competition, Calatrava’s design draws on forms found in traditional Islamic art and architecture, while merging modern and sustainable design paradigms with the aesthetic. The curvature of the towers appears, from the render, to be derived from bézier curves (a form of mathematical parabola) which are comprised from straight lines. These lines, most likely to be steel cables, would be attached to a central core which rise up and punctuates the Dubai skyline. “Combining Islamic architecture with modern design, the tower at Dubai Creek will become a national monument as well as a cultural and tourist destination,” said Mohamed Ali Al Alabbar, president of Emaar Properties. The same developer was also behind the Burj Khalifa. “In our proposed design, we have united local traditional architecture with that of the 21st century,” said Calatrava in a press release.